Patient feeling inconvenience when squatting as the mass is hindering with the flexion and some times patient is feeling as she is falling due to sudden restriction of knee movement on climbing, getting down of stairs. No history of pain, trauma or fever. No history of similar swellings on other sides. Non tender, with no local rise of temperature,Single, sessile, bony hard swelling along posterior aspect of the thigh region. 5/5 cms., non tender, immobile with no change of size and shape on muscle contractions. No change in position with movements of the nearby joints. Smooth surface with well defined margins. 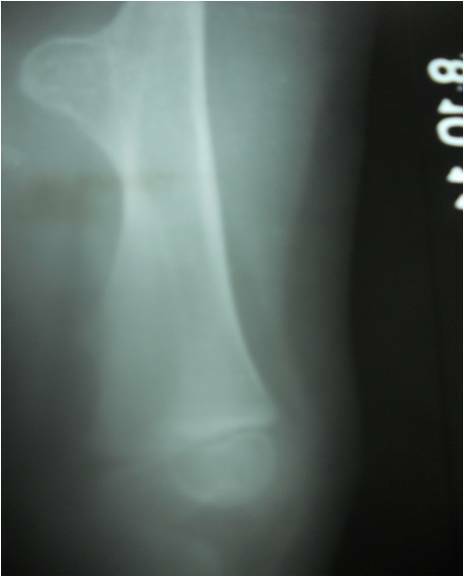 Mechanical obstruction for complete flexion of the knee joint.